MAN O' WAR is a beautifully maintained 1998 540 Sundancer. Known for her great looks and luxurious accommodations. The Master stateroom is amidships with Island Queen and private head. Guest stateroom is forward. Galley is open to the salon with high gloss bird's eye maple interior. Salon settee converts to a bunk with a press of a button. Washed, waxed and ready to go cruising. United Yacht Sales New Jersey would love to guide you through a personal showing of this 54' Sea Ray 540 Sundancer 1998. 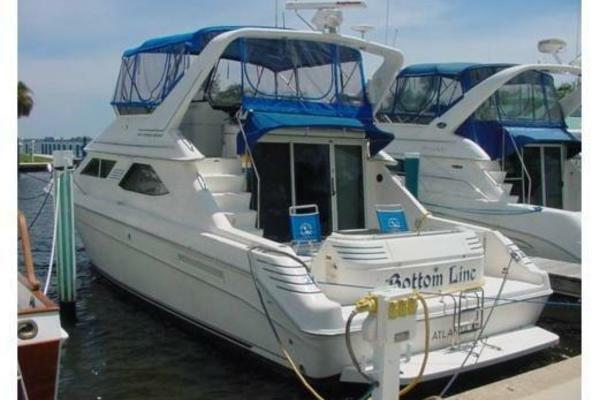 This yacht for sale is located in Lake Simcoe, Ontario and priced at $249,900. For a showing please contact us by filling out the form on this page and we will get back to you shortly! Two stateroom layout. Large guest stateroom forward with island queen. Working aft, full head with stall shower to port. Salon features an electric ultra leather sofa that slides out to make a comfortable bed with a press of a button. Aft of the salon is the huge master suite with it's own private head and shower. Flat screen TVs throughout. Skipper and crew have excellent 360 degree visibility from the raised helm. Cablemaster shore power retrieval systems for both the 50 and 30 amp shore cords, depending on your needs. Westerbeke generator is housed in it's own sound shield in the aft portion of the engine room. L-shaped cockpit settees convert electrically to a massive sun-pad. Two zones of air conditioning cockpit. Upholstery is in great condition.